to a triathlete and marathon runner..."
You care – really care – about your health and the health of those you love. Do you fit one of the descriptions below? If so, this book is a must read for you. 1. Are you currently dealing with a health challenge? Your particular challenge may be serious – even life threatening – or it may be a mere annoyance. Either way, it’s interfering with your life, and you want to find a holistic health solution to it. Maybe you’re a fighter and aren’t willing to throw in the towel just yet. Or maybe you’re tired, even exhausted, and you’re ready to give up. That’s the journey I traveled; that’s where this book comes from. On my healing journey, I learned a lot, I grew, I evolved, and today I’m thriving! If it can happen for me, it can happen for you! 2. Are you in great health? If so, congratulations! This book is especially important for you. The lessons I learned – and that I share with you in this book – aren’t just about turning poor health around. They’re about allowing vibrant health to blossom in your life. My starting point was chronic, debilitating pain. And among my milestones – so far – are that I have run a marathon and a half Ironman triathlon! And my health just keeps getting better. If your starting point is robust health and if you begin applying these lessons now, imagine the possibilities that will emerge in your life. This isn’t a book about curing, managing or even preventing pain or disease. You are much more than a collection of problems. You are a whole, vibrant, living human being with unfathomable potential in all areas of life, including your health. This is a book about finding and revealing the vibrant health that you already possess. Turn my health inside out! I traveled a long, winding, bumpy road before I figured that out. When I finally did, I realized that the lessons are really very simple and timeless. I’m providing years’ worth of “learning the hard way” to you in this one book. Buy Oby's Wisdom NOW on Amazon! Want an autographed copy of Oby's Wisdom? See the special offer at the bottom of the page. E-book available exclusively on Kindle. Oby is the nickname of Obsidian J. Stone, my lighthearted fictitious depiction of a wise man from a simpler time. In this entertaining book, you will also get to know Oby’s wife, Fern, their toddler son, Scooter and their little dog, Proto. Their lives serve as the perfect illustration of the incredible power of Nature that allows all of us (yes, that includes you) to heal. Oby and his contemporaries didn’t have a healthcare “system.” All they had was the Doctor Within. Despite the enormous challenges of their time (and ours), the Doctor Within has allowed humans to survive and thrive from the days of stone tools to the space age. The first, and most powerful step toward finding a solution to your challenges lies in reconnecting with your Doctor Within. Are you making the BIG mistake that almost everybody else is making? Conventional medicine is making this mistake, but they don’t have a monopoly on it. Not even close. The alternative healthcare world, as a whole, is making the same mistake. So is the government, our society and probably you, too. Until we correct this mistake, our healthcare system will continue to be ineffective. Until we correct this mistake, healthcare reform won’t work. And, until you correct this mistake, you’ll never reach your peak health potential. In other words, we devote so much of our time, energy and resources to fighting, curing, fixing and preventing problems, that we lose sight of our possibilities. And the more we focus on IT, the more we trap ourselves in IT. In my case, IT was arthritis. For you, IT may be anything from a cold to cancer, from heartburn to a heart attack, or from pounds to pimples. Complexity. We have made health WAY too hard. There are so many drugs, surgical procedures, supplements, machines, natural healing modalities, diets and exercise programs that we don’t know where to turn. There is a ton of research that proves that all of them work…and…there’s a ton of research to prove that all of them don’t work. The result is overwhelming confusion! Helplessness. We’re faced with so many choices and conflicting theories that it is hard to figure out what to do. Wise doctors, convincing authors and slick advertisements keep us bouncing from one miracle cure to the next, always seeking that elusive silver bullet that will finally “work.” I don’t know about you, but for years, I felt like a gerbil running in an exercise wheel because I just didn’t know where else to go. That’s what made me want to give up. Expense. None of these complex competing healthcare choices are free. I’m guessing that you have already spent hundreds, maybe even thousands of dollars - not to mention the countless hours of your precious time - spinning in the wheel. I am not suggesting that we never pay any attention to IT. Sometimes that’s appropriate…BUT…when we only pay attention to IT, we’re looking for solutions from the outside. Healing – real healing – comes only from within. I’ve walked the healing path myself! Mine was a long and winding journey. All along the way, IT was an unwelcome travel companion that I just couldn’t seem to get rid of, no matter how hard I tried. And believe me, IT was a real pain! I tried every trick I could think of but IT just kept hanging around. Sometimes I would shake IT for a little while, but IT always found me again. Along the way, I missed out on more than I care to think about. Recreation, play time with my growing son, sleep, happiness…all were overshadowed by IT. IT even ended a successful a career that I loved. At age 23, I developed severe inflammatory arthritis. At the time, I was in the Marines so I had to keep myself in top physical condition. I was an athlete and I enjoyed spending time in the great outdoors. Needless to say, arthritis did not fit in with my active lifestyle. At first I ignored IT, but IT just kept getting worse. So I fought IT. After all, I was a Marine. Victory was the only acceptable outcome for me. The battle raged for years. Along the way I learned Nature’s secret to health and well-being. Even after it was revealed to me, for a long time this secret remained hidden behind the dark veil of my pain. When I finally embraced and embodied the secret, my health and life finally started to take a positive turn. Since then, my health has continued to improve beyond anything I could have ever imagined. Many people have told me that my story is inspiring but I’m always quick to point out that there’s nothing special about me. Well, actually there is something special about me. Very special. And whether you realize it or not, that is every bit as true for you as it is for me! We have all heard inspiring stories about people who have overcome terrible adversity and gone on to do great things. Accident victims who have been told they would never walk again have won Olympic medals. Cancer patients given only months to live have gone on to not only survive, but to enjoy long, productive and fulfilling lives. Other people have lost limbs or shed huge amounts of weight and then competed in Ironman triathlons. The breadth and depth of human potential is breathtaking! And you (yes you) have that same potential! My journey back to health was a long and challenging one. If I had known then what I know now, it would have been a lot shorter and smoother. That’s why I wrote this book: to share Nature’s powerful secret with you so that you can unleash your potential. Just a few years ago, I could barely walk up one flight of steps. 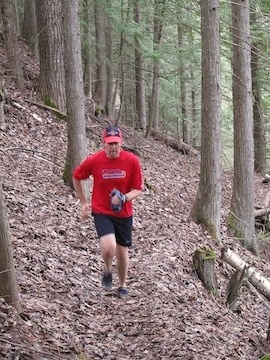 Now, I love to run trails! At this point you may be thinking, “OK here it is. He’s going to tell me that I have to buy his book to learn what the secret is.” Nope, I’m not going to do that, because I don’t feel this powerful secret of Nature is mine to conceal. You’ll know the secret before you get to the next headline. First, I need to be honest with you. This mysterious secret isn’t really a secret at all. But it might as well be. Everyone during Oby’s era knew it and lived by it. But it has long since been forgotten because our “modern” medical system has obscured, ridiculed, denied and concealed it. To illustrate this powerful secret, let me share a story about an important lesson that a monkey taught me. During a trip to India several years back, I visited an old fortress that had a large population of monkeys. Although the monkeys usually managed to tolerate the thousands of visiting tourists, I learned the hard way that sometimes they can become downright unfriendly. I ventured a bit too close to a female monkey who had a baby with her. She felt threatened and attacked me. Monkeys have sharp fingernails and the attack left me with several deep, bloody gouges on my forearm, not to mention a phammering heart and a terrified tremble. What did I do to treat this potentially serious wound? Well, basically, nothing. No antiseptic or antibiotic ointment found its way to my cuts, nor did any bandage shield them. Afterwards, contrary to conventional medical wisdom, I chose not to get a tetanus shot. My scratches never got infected and they healed nicely with no scarring at all. My arm was able to heal without any outside intervention because of the secret of Nature that I keep referring to. Your body is smart, too! Nature designed all of us to be healthy. That’s why we all have a Doctor Within that takes care of us throughout our lives. The Doctor Within is the most brilliant doctor there has ever been! It is this Doctor Within that allows us to heal, grow and thrive. One of the greatest things about your Doctor Within is that (s)he is free! You’ll never have to worry about paying for an office visit or a co-pay; and your Doctor Within is always on call…no crowded waiting rooms…no forms to fill out…no insurance necessary! Unfortunately, though, our collective approach to health has caused almost everybody to forget all about the Doctor Within. Getting reacquainted with your Doctor Within is a critical milestone on the road to healing and wellness. Oby’s Wisdom will teach you how to use your Doctor Within in all areas of your life: nutrition, exercise, your emotional and spiritual health, children’s wellness, and life in general. So…how can I be so bold as to say that Oby’s Wisdom is the first wellness book you should read? There are tons of books out there about wellness. And a lot of them contradict each other. Yet they can all quote scientific studies to back up their point of view. So, how do we decide what we’re supposed to believe…? Oby’s Wisdom presents simple, foundational concepts that work regardless of which side you take in an argument – or whether or not you even decide to take sides. New frame: Turn your health inside out! Turning Health Inside Out consists of developing a wellness mindset and a wellness lifestyle. Stop avoiding and start living. Healthcare that will work: Stop worrying so much about IT and start taking care of you. At your core, your real reality is vibrant health and well-being. The Big Idea: Turning your own health inside out benefits everybody else’s health. Mom is packing a lunch. This section addresses the critical importance of breastfeeding. Empower your potential, not your problems. The Gunny. This story is about a U.S. Marine Corps Gunnery Sergeant I once knew, that many readers will identify with. His desperate attempts to lose weight and save his career - and how those attempts backfired - illustrate how our society’s myopic focus on good looks and scales, rather than healthy lifestyles, can cause people to make unhealthy, and dangerous choices. The old long haired dude in the mountains who taught me the first rule of fitness. I’ll share it with you in the book. The stories of Maddie and David, two kids with severe scoliosis, each had very different outcomes because of the contrasting belief systems and attitudes of their doctors and their parents. David’s story has a happy ending. Maddie’s—unfortunately—not so happy. In addition to true stories, Oby’s Wisdom includes many entertaining, original parables that present fresh, thought-provoking concepts in an entertaining light. First, of course, Oby, Fern and Scooter appear throughout the book to show how following Nature’s simple but brilliant plan is the most effective path to robust health and well-being. Win and Tank (nicknames for Winifred and Tanicus) are two new business professionals whose contrasting perspectives in their quest for success – and their opposite results - serve as a metaphor to show you something that very few people know: “prevention” and “wellness” are two very different approaches to health and well-being. The Gym and the Trout Stream is a humorous story that shows how to choose the right exercise program for you – one that will lead to improved health and well-being in your life. Choosing wrong will only stress you out and lead to failure. Oby’s Wisdom will introduce you to some thought-provoking ideas that will open your eyes to new possibilities in your life and stretch your thinking about health and healing. Modern medicine has made only a minor contribution to increased human life expectancy. Saying that germs cause disease is like saying that flies cause garbage dumps. Most doctors and alternative healing practitioners do not understand wellness. According to the AMA, modern medicine is the third leading cause of death in the U.S.
War on drugs? Really? Our system makes drug abuse perfectly acceptable. Treating the underlying cause is not really any different than treating symptoms. Low cal, low fat, low carb, slow carb, beer and cookies (I’m not making this up)…all diets work. But none of them work. Dr. Mark’s definition of dieting: A process of doing something you don’t like, to take care of something you don’t like. How can that succeed? Exercise is for elevating your spirit, not just your heart rate. Mother Nature has a plan for child development…but parents and doctors keep getting in the way. If Edison and Einstein were children today, they would both be drugged. PRACTICAL benefits that you will gain from this book. In addition to the great stories and fascinating concepts you’ll enjoy, Oby’s Wisdom provides plenty of practical information to help you incorporate Nature’s simple wisdom into your own life. If Nature’s plan were too complex, no living thing would ever have survived. Today, so many people are struggling because we have made health and well-being very UN-simple. Oby’s Wisdom brings Nature’s brilliant and simple plan back into clear focus in a way that is easy for you to understand and fun to incorporate into your life. Now, finally, here is the solution: Never go on a diet again! Dieting trends will always change. Today’s food fad is tomorrow’s folly. Oby’s Wisdom will teach you, once and for all, a simple, sensible and enjoyable approach to healthy eating. How many different exercise programs have you tried? Are you getting enough exercise these days? Oby’s Wisdom will teach you The First Rule of Fitness, the most important thing to know if you want you successfully stay committed to your exercise program. Your body is not just for display; it’s where you live, work and play. Nature’s most powerful healer for children. Important considerations for deciding whether or not to vaccinate your children. The importance of unstructured play—guided by a child’s own spirit—for physical, mental, emotional and spiritual health and well-being. How rolling around in the grass, making mudpies and sloppy puppy kisses all turn your kids’ health inside out. A free Video Action Guide and a free Reading Group Guide! A free Video Action Guide to help you incorporate the most important lessons of Oby’s Wisdom into your hectic life. Do this action guide alone, or with friends, co-workers or accountability partners. free Reading Group Guide; six pages of insightful questions that will allow you to discuss the inspiring and thought provoking lessons from Oby's Wisdom! with your reading group, friends, significant other or family. I will donate 10% of the profits from Oby’s Wisdom to charitable wellness-related causes. Details are in the early pages of the book. 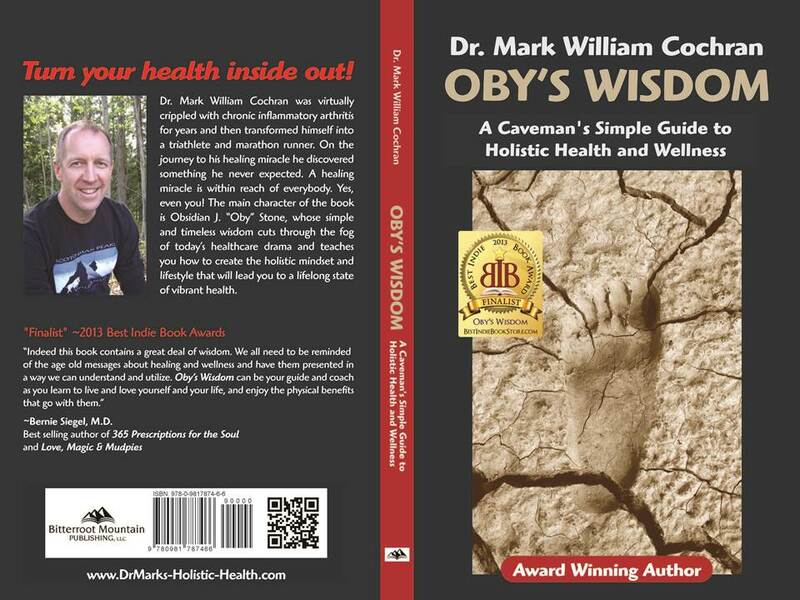 Order your very own autographed copy of Oby's Wisdom! (2nd edition) for a special price of only $17.97. Oby’s Wisdom is an excellent educational resource for corporate wellness programs and other wellness education courses. For large orders, I will be happy to work with you to customize the content and design of Oby’s Wisdom to meet your unique needs.